RESPONDING TO HARRY KROTO’S BRILLIANT RENOWNED ACADEMICS!! 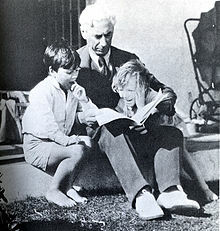 Part 149 II Sir Bertrand Russell:We may define “faith” as a firm belief in something for which there is no evidence. Where there is evidence, no one speaks of “faith.” We do not speak of faith that two and two are four or that the earth is round. We only speak of faith when we wish to substitute emotion for evidence. Bertrand Russell:We may define “faith” as a firm belief in something for which there is no evidence. Where there is evidence, no one speaks of “faith.” We do not speak of faith that two and two are four or that the earth is round. We only speak of faith when we wish to substitute emotion for evidence. 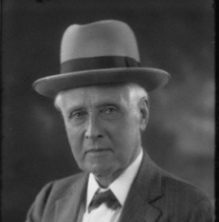 Well Bertie, we got some evidence for you below from Sir William Mitchell Ramsay who was your contemporary. I see that there are several active posts attempting to question the historical veracity of the Bible. Clearly the attackers have not run across Sir William Ramsay: “First Professor of Classical Archaeology” and “Lincoln and Merton Professorship of Classical Archaeology and Art” at Oxford, and “Regius Professor of Humanity” at the University of Aberdeen, if you are into academic titles. I’m grabbing a few snippets from his Wikipedia biography which as far as I’m concerned puts the question of historical veracity of Biblical accounts to rest. Here we have a skeptical archeologist who set out to prove once and for all that the New Testament was fiction. He wound up proving the opposite and became a Christian himself. 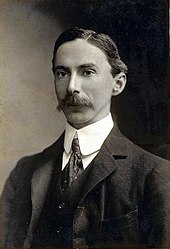 William Ramsay was known for his careful attention to New Testament events, particularly the Book of Acts and Pauline Epistles. When he first went to Asia Minor, many of the cities mentioned in Acts had no known location and almost nothing was known of their detailed history or politics. The Acts of the Apostles was the only record and Ramsay, skeptical, fully expected his own research to prove the author of Acts hopelessly inaccurate since no man could possibly know the details of Asia Minor more than a hundred years after the event—this is, when Acts was then supposed to have been written. He therefore set out to put the writer of Acts on trial. 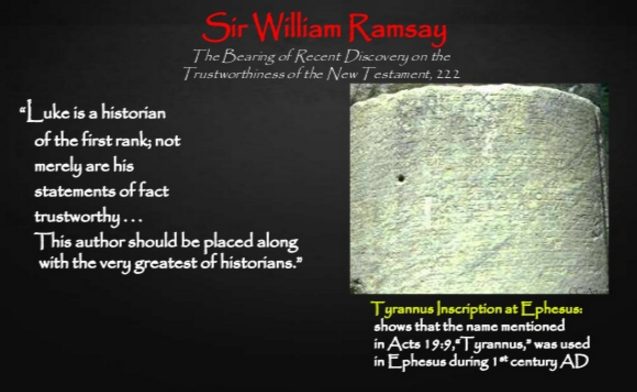 When Ramsay turned his attention to Paul’s letters, most of which the critics dismissed as forgeries, he concluded that all thirteen New Testament letters that claimed to have been written by Paul were authentic.